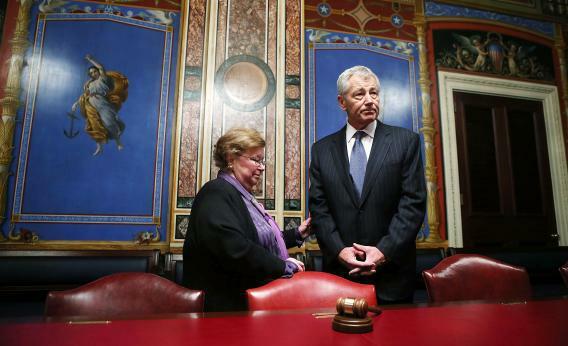 The Hagel Vote: Tuesday at 2:30 p.m.
U.S. Senate Appropriations Committee Chairman Barbara Mikulski (D-MD) meets with Chuck Hagel on February 7, 2013 on Capitol Hill in Washington, DC. Update, 3:08 p.m.: Sen. Jim Inhofe, ranking Republican on the Armed Services Committee, tells the National Review he will fight to postpone the Hagel vote for “as long as it takes,” but admits he can’t stop the committee from voting “aye” tomorrow. Carl Levin’s Armed Services Committee announced the first fully scheduled vote on the Chuck Hagel nomination: 2:30 p.m. on Tuesday. Republicans ran a well-earned victory lap for delaying last week’s possible Thursday vote, but since that punt, The Atlantic Council released its donors, anti-Hagelians failed to find a scandal in those lists, and nobody changed his/her mind on the nominee. I wrote on Friday about the serial downgrading of these anonymous threats. We’ve gone from, “We’ll prove he’s an anti-Semite!” to, “Shucks, it’d be a shame if the vote that confirmed him were partisan.” Peter Beinart, whose Open Zion has bloomed with pro-Hagelia, says that the Republicans have largely blown it by ignoring current foreign policy questions as they make the case against him. I agree, insofar as they might have tripped up Hagel by asking about those questions. Instead, we’ve seen a pop cultural rebellion—a minor one—in which The Onion, The Daily Show, and Saturday Night Live are mocking Republicans for making the hearings largely about Israel and Hagel’s deep-seated feelings.